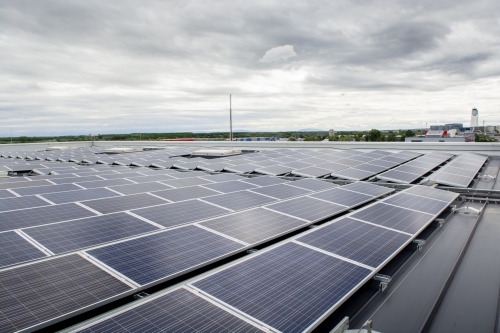 The PV system on the roof of Vienna International Airport (image courtesy of IBC Solar). IBC SOLAR Austria has installed two PV systems with a capacity of 509 kWp on the roof of Vienna International Airport. It is hoped that the two PV systems which were mounted onto the roof surfaces of a hangar and an equipment hall will produce more than 500,000 kWh of solar power per year for direct self-consumption. "In the future, around 3,200 sqm of environmentally-friendly solar power will be produced at Vienna International Airport," says Heinz Schuld, Project Manager at IBC SOLAR Austria. The aim over the next few years, according to IBC Solar, is to build an additional module surface measuring up to 4,000 sqm per year at Vienna International Airport. The next major project will include equipping the roof of the Air Cargo Center with photovoltaic systems measuring around 5,000 sqm, which means that the facility will more than double in size by 2017. By putting PV systems into operation, Vienna International Airport (Flughafen Wien AG) is consistently pursuing its sustainability strategy. This has resulted in CO2 emissions being reduced by around 20 percent over the last three years, according to the company. The company says it will also continue to focus on energy efficiency in the coming years and is aiming to achieve significant improvements in the efficiency of power, heat, cooling and fuel consumption by 2022, in order to continue to reduce CO2 emissions. Flughafen Wien AG was awarded with the EMAS Prize 2016 from the Austrian Minister of the Environment for its exemplary environmental management.